Welcome to Lisa.B.Designs : Extravaganza Day!!!! Come & join in the fun from 10am to 4pm. 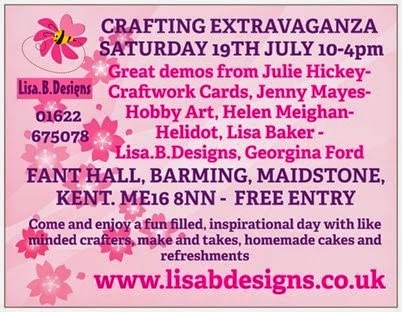 Not only will there be great demoes from top craft demonstrators, lots to buy, a project for you to make & take home, there will also be a vast sale of all sorts of crafting goodies. AND the raffle this year is in aid of The Heart of Kent Hospice, a great cause.